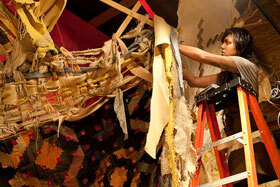 A sneak peek of Swoon and her collaborators show "Distance Don't Matter" opening Oct 15th. SPACE has invited New York artist Swoon and her collaborators Ben Wolf, Greg Henderson, Conrad Carlson, Monica Canilao and Ryan Doyle to construct an installation of found materials, wheatpasted prints, paintings and more. Photos below by the director of Space, Nat May.